On Friday morning when the driver attempts to get to the bank or store in Bucks County aria, they found that most of the roads were blocked, and the helicopters were circling over the town. At home located on Cypress Avenue police found two 9 mm handguns and a fake AK 47 in the 14-year-old’s bedroom, according to officials. Police also arrested boy’s parents; 50-year-old Lizabeth Donohoe and 48-year-old Mario Russo. Officers reported seeing numerous air soft weapons and knives, machetes and swords, fire pellets and marijuana in the mother’s possession. Donohoe was charged with endangering the welfare of a child. Mario Russo was charged with obstruction of the administration of justice and resisting arrest and released pending summons. 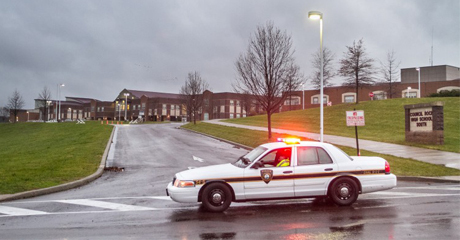 Investigators said to NBC News that it appears no other students were involved in the threats. The 14-year-old is being held at the Bucks County Detention Center, according to police. “He was going to bring weapons into the school and he was going to kill and harm people at the facility,” said Northhampton Township Police Chief Barry Pilla to CBS News. “We can choose to live in fear for these kinds of things, or we can take some degree of solace knowing and comfort in the fact that kids reported well,” said Superintendent Mark Klien during a news conference Friday. Colorado Massacre at Night of "the Dark Knight"